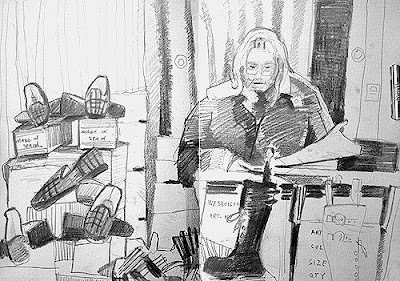 This bedroom slipper salesman caught my eye in the market today. Am I going mad? 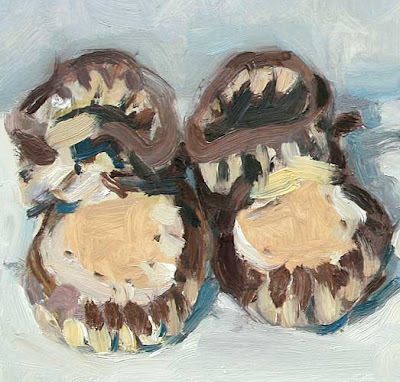 Has the winter wet & grey season driven out my plein-airist, colourist poetic landscape urges?Slippers have the same connotations in France as elsewhere. Someone who is ‘Pantouflé’, speaking familarly, is someone who behaves like a house-bound retired person, shuffling around in slippers. Figure in a landscape. ‘Pays’ et ‘Paysan’ (Occitan doesn’t distinguish between inhabitant & region, the person & the place are the same). Market places in SW France. Seller & product. Here in the little rural markets, sometimes the seller is also the maker, ‘le producteur’ & not the reseller, ‘le revendeur’. I felt a bit naughty drawing this. Sure the venduer was a good fellow. I had a joke with him. But it’s not much of an art subject is it? Slippers? What does it matter the mental-roads, the curious byways of thought & reflection that an artist takes? It’s the end result that counts…. isn’t it? OK the drawing itself isn’t fabulous, not one of my best. But what do you think about the subject matter? Tell me, am I going nuts? Recently, my internet buddy & talented pastelist CASEY KLAHN & myself had an interesting exchange about whether a barn is worthy of a painting & if so, why. ADAM : I haven’t thought it through 100 PERCENT but I have feeling that maybe artists who work with images of rurality have two basic directions. One is make it picaresque & pardiscal, for example like a pretty Kincaid, a beautiful Claude Lorrain or a formalist abstraction. Or go the other direction, which is basically that of the realist programme, where one actually paints what is there, the realities of unadorned everyday life, without making it an asethetic entity. Without dressing it up, as it were. Casey : I feel that the architecture in that old Gambrel barn is something wonderful. 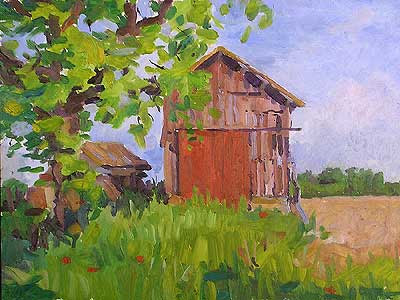 On the other hand, when I paint a whole farmstead, I have to hide or obscure the tin sheds. I have posted recently about our local star, Rachel Maxi, who does realist garbage containers, called “dumpsters”. It’s a contemporary and unified theme. I love Casey’s answer. To paint rubbish bins or not?? Is that the question? The Realist programme (Courbet, Manet, Sickert, Hopper, Warhol, etc) in painting advocates that modern, contemporary life should be the subject matter & not standard ‘art’ subjects. A lot things are edited out of the picture when most people come to paint a rural landscape. They are considered not ‘art’ subjects. No previous model nor example. No precedent. The normal riposte to the Realist programme is that is UGLY. Not beautiful. Rubbish bins are ugly, they smell & there’s something offense in waste. But do you remember the film ‘American Beauty’? The scene at the end, where the young man is entranced by a shopping bag flying around in the wind. Under the spell of rubbish. Right, stop. Before I go completely off on a tangent. A road to nowhere. Anyway, here’s some more slippers from last year. I like them. They make me happy. They are personal & intimate to me. What do you think about ‘French Market Places’ as a label for this type of genre? Actually in my computer I classify them under the title of drawings>streets. The slippers struck me. 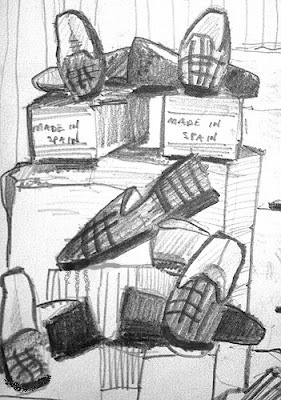 It is a good drawing – the pyramid and the varying thicknesses of line. For some reason, the shading makes the whole thing look warm – although the color is gray! You totally overcome the subject. Way to go! I respond well to the label name, Fr Market Place.